Looking for something different? How about this different flavor combination with traditional meatballs? Unique, delicious, smokey, deeply flavored… I could go on. 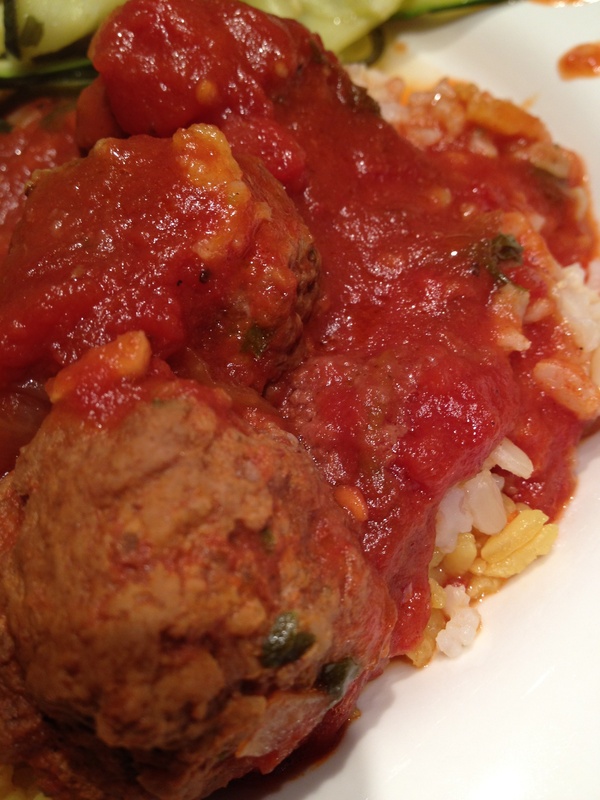 But you really need to taste them to believe how great these Mediterranean Meatballs are! In food processor pulse tomatoes and juice until smooth. Pour into lidded tagine or lidded large saute pan. Stir in olive oil, one minced garlic clove, half of the parsley, 1/4 tsp each of cumin, paprika, cinnamon, and salt/pepper to taste. Cook over low heat until thickened slightly, about 10 minutes. In food processor (no need to rinse) add onion, one garlic clove, half of the parsley and pulse until chopped. Add meat and 1/4 tsp each of cumin, paprika, cinnamon, and salt/pepper to taste. Pulse until smooth. Roll mixture into balls, about 1 to 2 inches in diameter. Gently place the meatballs into the tomato sauce, cover and cook over low heat until meatballs are cooked through, about 45 minutes to one hour. Serve over rice, or rice with some saffron blended in.